The terra cotta otter planter that survived many winters in Ballard didn’t do so well at our new place, so now she’s garden art. As autumn settles in, I’ve been taking care of winterizing tasks, which included transplanting some thing from our planters to other locations. Living in an apartment, we don’t have quite as much winterizing to do as some people, but there is still work to do. Fans and the a/c unit get taken down and put away, for instance. I put away some of the summer clothes and pull out warmer clothes. Our wooden folding table out on the veranda (our third-story deck) needs to be rubbed down with oil (I used butcher block oil and butcher block conditioner) to keep it waterproof for another year. The grill needs to be cleaned and covered. Things like that. This year that also meant that a tree need to be transported. Not long after we moved to this place last year, I noticed an unfamiliar plant growing in the very smallest of the flower pots that used to sit on our porch at the old place. Once the leaves reached full size, I identified it as a Turkish Filbert (also know as a Eurasian Hazel), which is a relative of the American Hazel from which we get hazelnuts. In our old neighborhood one house up the street from us had a Turkish Filbert in the front yard, and I was used to seeing the distinctive filbert seed pods on the sidewalk each fall. I realized that the neighborhood squirrel had buried one of those seeds in my flowerpot. Over the years we’d lived there, I was used to finding rotted peanuts and the occasional chestnut in the flowerpots whenever I put in new spot color flowers. This was the first time, as far as I know, that the squirrel gave us a filbert. And it was the first time one of the nuts buried in our flowerpots sprouted. 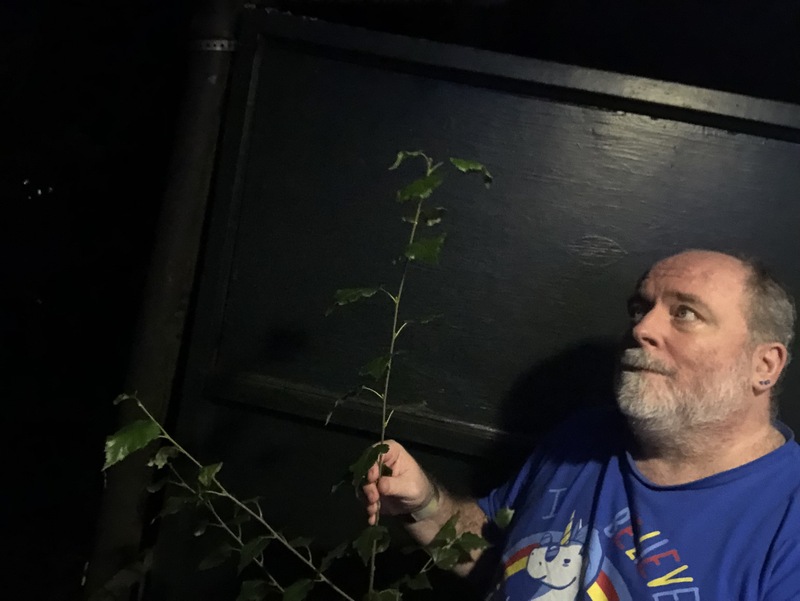 I took it as a sign that a squirrel god wanted us to grow the tree, and had thought I might be able to keep it going in a planter for a few years before needing to find it a forever home. It only grew to about 8 inches tall during our first summer, after all. Of course, it was also in the tiniest flowerpot I owned at the time. A final time measuring the height of the filbert before send it to its new home. After it’s 9 leaves turned yellow and fell off last year, I transplanted the entire contents of the pot into a larger planter–one of four large ones I got to grow the irises I had salvaged from the flower bed we’d been allowed to use at the old place. I should have realized that the bigger planter, having a lot more room for roots, would mean that the tree would grow a lot faster in its second summer. The filbert in its new home. Fortunately, our friend Jeri Lynn was amenable to trying the filbert in her new yard, so we had planned this fall to move it. Before we got to that point, I had other work to do with the planters. 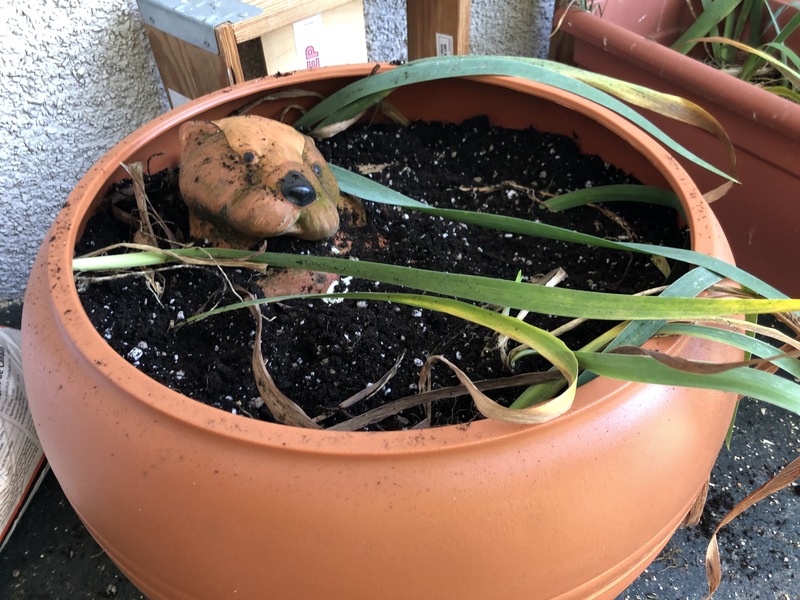 Another of the pots that had come with us from the old place was this very cute terra cotta planter int he shape of a sea otter. I’d been growing pansies and violas and dianthus and similar annual flowers in it for years sitting either on our concrete porch at the old place, or sometimes on the concrete walkway or sitting in one of the flower beds. Since the structure I call our veranda is a deck sticking out the side of an apartment building, and there are neighbors with their own decks below us, all of my flower pots and such are either completely contained, or they have catch basins under them, to prevent overflow from watering sending muddy water down on the neighbors. I’d found a gorgeous, ocean-colored glazed dish that was big enough for the otter and left the otter in the dish over the winter. I didn’t think about how, during the rainiest part of the winter, this meant that the otter was sitting in at least an inch of water. Which means that the potting soil inside the otter was constantly 100% waterlogged. So when temperatures dropped below freezing, the otter was broken. Badly broken. So broken that in the spring I couldn’t get water to stay in the potting soil long enough to sustain the flowers. My husband found me a new otter planter, which I have now placed in the glazed dish on little lifts that keep the pot above any water in the dish. But what to do with the old otter? I couldn’t bring myself to putting it in the trash. So I suggested to my husband (who is slightly less sentimental than me) that he should wait until sometime I was gone, and he could dispose of the otter, and I could pretend she has swum away. When I mentioned this on line, our friend Katrina asked why I couldn’t transform the otter into art by burying it in a large planter, so the otters head and forepaws (which are still mostly intact) was visible above the soil, and plant a bunch more of the irises around it, so it looked like the otter was in a bed of seaweed. I finally found a planter that would work, and I did exactly that a couple of weeks ago. The irises you can see in the photo above came out of the planter with the filbert. I planted 9 iris rhizomes in that planter with the tree, and by the end of summer I had 18 iris plants in the planter (the other three planters didn’t double, but all of the planters had at least some new irises by the fall). 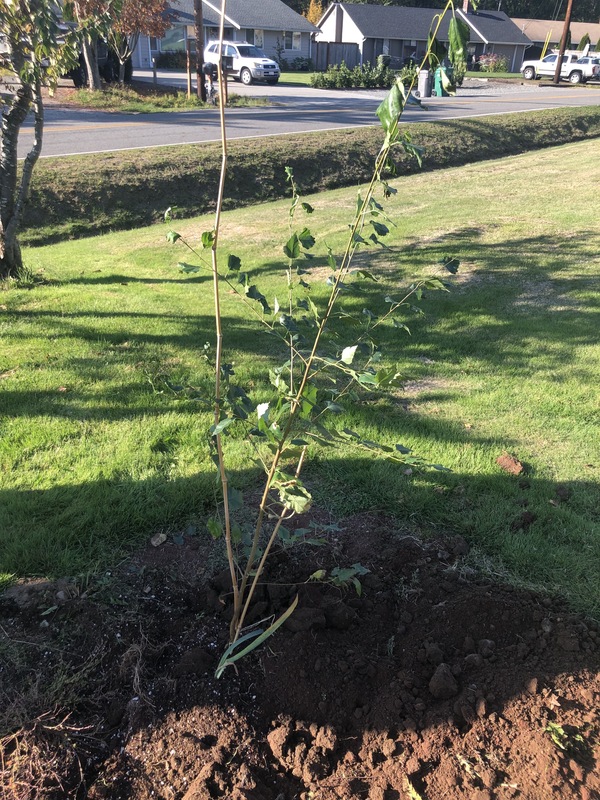 So I dug up about of third of them from the end furthest from the tree (figuring their roots were less likely to be tangled with the tree’s root), and put them in the new planter. Saturday night, after our monthly writers’ meeting, we carried the planter down to our friend Matt’s truck, and he transported it to Jeri Lynn’s. Then on Sunday I drove up, helped them transplant the filbert and the remaining irises, then took the planter back home. There, I filled the planter with all the remaining unplanted rhizomes (there were a lot of irises at the old place), and covered them with potting soil. It’s a lot denser that I’d packed them in any of the planters last year, but I figure they’ve been sitting in a box for two growing seasons, and a lot of them probably aren’t viable. Don’t get me wrong, every one of them might sprout and I have dozens of irises coming up in that planter next year. And I won’t mind a bit! I just hope that some of the irises in the other planters actually bloom next year. I assumed that this year they were in a recovery mode from being dug up in the spring, rather than fall as you’re supposed to, and so on.